It's easy to think of creativity as being about big ideas. We live in a world where big ideas are prized and celebrated and smaller ideas get pushed away. We celebrate those who have big ideas and we cherish the larger-than-life works they produce. But at the heart of all big ideas are small changes: the minor influences that shape a concept, or spark an insight. They're easy to overlook and their impact can be hard to understand, so we tend to brush them aside. Even in our own lives: small creative changes can feel unworthy of celebrating. We make a small change but because it's size is relatively small we fail to see it as being impactful. One reason I love writing is because the influence a small change can have is immediately evident. He said she was the last one to leave the room. Is this "he" to be trusted? Who else may have an opinion on the matter? Is the statement itself to be trusted? If he said she was last to leave the room, what other evidence is there that this is the case? What is not being said? Emphasizing the second character makes the phrase almost accusatory. Who is this "she"? What other information can we learn from her? In the world of visuals small changes can have a dramatic effect as well. No where is this clearer than the human face, where we convey seemingly simple emotions through thousands of small signals around our eyes, mouth, nose, ears, angle of our head, and so on. 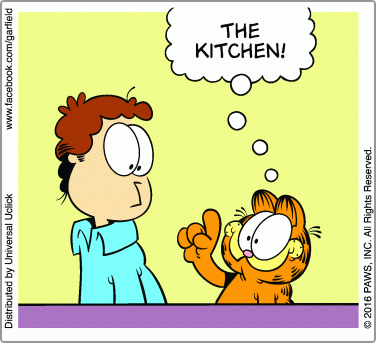 If we take a simple and meaningless-out-of-context cartoon comic panel, this one from the comic strip Garfield, we can see how something as simple as drawing on eyebrows can change what the panel is trying to communicate. In each of these examples the only thing we're doing is making one very small change: emphasis of a single word, or the angle of a single line, yet with each change comes a dramatic effect. The same point is true of the ideas we have: small, almost effortless changes can have incredible impact. From how we think about a problem to how we view someone, subtleties play a big part in the larger picture. Perhaps part of the reason we tend to celebrate the bigger changes—the invention of the airplane or the shift from horse-drawn carriages to automobiles—over the smaller ones—deciding to wear a different type of shirt out or adding a line to the face of a cartoon character—is because the smaller changes are easier to do. It doesn't take much to incorporate a small change in anything. Yet we also tend to ignore making these small changes for the same reasons: if they're easy to do, they must not be worthwhile. Of course we can see that this isn't the case. Small changes have really profound impact, particularly when you scale them: what would happen in the Garfield comic above if we drew a second angled line on Garfield the cat? What would happen if we emphasized two separate words in a sentence? If you want to be creative you don't need to focus on big changes or global-sized problems; you merely need to look at what small changes you can make now, then make them. Not because they're easy, but because until you make the change you won't really know the affect it can have. Creativity is making small changes. Easy to forget, but also easy to try.